How does one dress as the chemistry job market? All black of course, then? 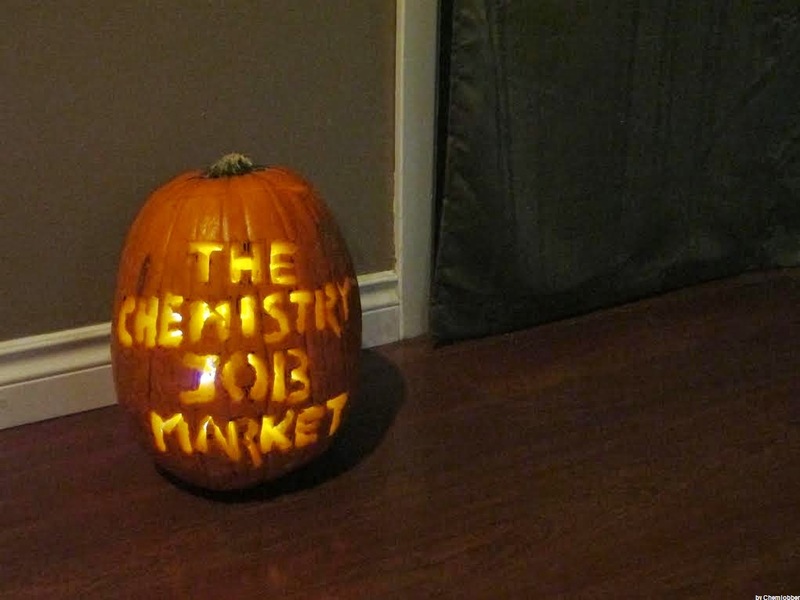 I considered dressing up as an employed chemist. Let me suggest employment in government. Most positions require a BS. Your pay is not going to be as much as in a tenure-track academic position or that job in big pharma, but there are consolations. Employment stability is greater and civil service and union regs protect you from managerial excesses. There is usually a good pension plan and the opportunity to contribute to a 457 (deferred compensation) plan. The talents and interests you developed while obtaining your advanced degree may lead to you being able to develop projects to advance the goals of your organization. Good luck and keep your options open. Government jobs? I've tried to get them. If you aren't a veteran, a current government employee, or a person with a disability, good luck. And if you manage to be one of the few who don't meet those criteria, but get an offer, you'll fail the background check if you have ever had any bad job reviews. Good luck! I have already tried several times for gov't positions, and while never making it as far as Anon 5:58 PM to background checks, agree with everything else that s/he has written. Even more insulting was the program for senior scientists who want to get their foot in the door. One needs to have a sponsor who is already employed there, before you submit your research proposal. I contacted an obvious sponsor at Wright-Patterson Air Force Base. Or at least tried to. He refused to return my e-mails or voice mails. I caught him twice on the phone, and he still refused to work with me. Finally I complained to the NSF about this treatment, and was told off by a gov't employee, who was basically clueless about the contents of their own website. It took several attempts to get hold of her, as well, and she too refused to respond to e-mail. On a different subject, "qvxb" suggests working as a BSc chemist for the government, even though one has a doctorate. I know that Bryan Balazs is following this blog, and so I would be interested in knowing if this is even permitted with LLBL (his own employer), Sandia, Brookhaven, PNNL, Argonne, etc. What's your definition of internet harrassment, GC? It will be hard to respond to your comments without describing the quality of your response using terms which CJ will delete. 1. and 2. The contact details of the person in question were present on a government website indicating that he would receive applications from candidates having my profile. He was not forced to include his e-mail address and telephone number. Obviously too, I did not contact him very frequently, because of course one wants to make a good impression. Duh. 3. and 4. The people with whom I filed a complaint were in Washington DC and not Wright-Patterson Air Force Base. They were not his superiors. If you are so certain of your own opinion, then please find a name or pseudonym with which you can be associated, otherwise the commonly used descriptor for people producing your type of comments is "troll". To answer GC's question about working as a BSc for the government even though one has a doctorate, I don't know. I've never heard this situation come up. And the hypocrite starts in with the name calling again. I'm just rephrasing your own description of your activities with what the people on the other end of the line would no doubt call it. Hey Bryan, beware getting on that contact list! You can ask Donna Nelson's office staff how well that worked out for them. Mr. Troll, sorry, but I have have no more time to play with you. Is government still even an option if you do your PhD and your postdoc outside of the country? You're so out of the loop, and your references are all foreign nationals. Plus it doesn't help if you were born in a really questionable place to start with. And I think if you're outside the country at the moment and looking to work with the government, you might as well not even bother to apply. There has also been a lot of material posted on the blog over the years about getting a job in government. Most of it has been negative, if you're PhD level and never had a government job before or an 'in'. Apparently a lot of advertisements are for insiders to get a promotion. But I don't want to limit this to just the US. I think this is the case in most countries (i.e. the EU and Canada).